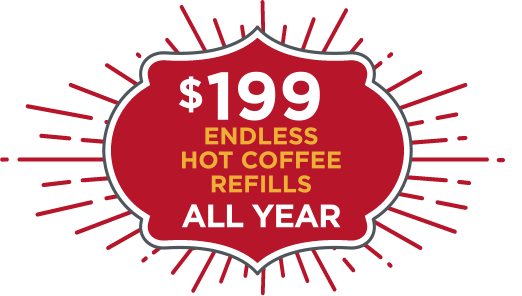 *Savings based on a 48-week average price of $2.05 per medium hot cup of drip coffee and includes price of mug. **Online orders available via pickup in café only. Endless Mugs are available for sale through 1/8/18, subject to supply. Endless Mug ownership is non-transferable and the mug can only be used by the owner. Endless Mug ownership entitles you to free refills, solely of hot coffee and tea, and only through 12/31/18. No refills of espresso drinks, lattes, iced. Refills require presentation of an Endless Mug by its owner at a register. No other vessels may be used. Refills may not exceed one per half hour. Refill at participating Au Bon Pain locations only. Some locations do not participate. Please see list of participating locations. The Endless Mug may not be returned after purchase, except where required by law. Au Bon Pain is not responsible for lost or stolen mugs and no refunds will be issued for damage, theft, loss or any other reason. Au Bon Pain reserves the right to end Endless Mug sales, membership or program at any time with a purchase price refund prorated by months remaining in the year. Purchase of the Endless Mug constitutes acceptance of these terms and conditions. Do not overfill; allow hot liquids to cool to a drinkable temperature. Wash before first use; hand wash recommended (do not soak or submerge). Mug is not dishwasher or microwave safe. Do not use for cooking or freezing.